Hi, I'm Terry Teachout. I cover the classical-music scene for Time Magazine and Performance Today on NPR. Everybody loves Aaron Copland's "Hoedown." But was the man who wrote "Rodeo" really a "great" composer, like Bartok or Stravinsky? Or was he just a purveyor of all-American souvenirs for the classical tourist trade? Read our live chat from November 14, 2000, the 100th birthday of Aaron Copland, the man who invented the sound of American classical music. npr_host: Welcome to the NPR Online chat. Our guest tonight is Terry Teachout, NPR Performance Today Commentator and music/dance writer for Time magazine. Copland epitomized the American classical-music sound with pieces like "Rodeo," "Appalachian Spring," and "Billy the Kid." Welcome, Terry! npr_guest: Hi! It's nice to be here, on the 100th anniversary of Aaron Copland's birth. npr_host: Are you ready for your first question? swic_01 asks: Did Copland write "Appalachian Spring?" npr_guest: Yes, Copland wrote "Appalachian Spring," and, as a matter of fact, I was present this afternoon at a performance of that piece broadcast over NPR. The Orpheus Chamber Orchestra peformed it at the Library of Congress' Coolidge Auditorium, which is where the piece premiered in 1944. It was quite an experience, sitting on that very stage where Martha Graham's dance company first performed her ballet to Copland's score, listening to Orpheus play it live before a really excited audience. I was pretty excited, too. swic_01 asks:: Is it true that his songs were based on American folk music? npr_guest: Lots of Copland's music is based on American folk songs -- "Appalachian Spring," for example, makes use of a Shaker hymn tune, "Simple Gifts." And you can also hear folk songs, cowboy tunes, and the like in his other popular ballet scores, "Billy the Kid" and "Rodeo." Copland was one of the first American composers to forge a truly modern style of American classical music while also making use of American popular music -- including jazz. swic_01 asks: What is he most famous for and what motivated his style of music? npr_guest: Well, I suppose Copland's best-known piece of music is the finale of "Rodeo," a movement called "Hoedown." It's based on an old-time fiddle tune, "Bonaparte's Retreat," and it's heard not just in concert halls and at the ballet, but in all sorts of other places -- like, for example, the "It's beef for dinner" commercial. You know, the one that Robert Mitchum does the voice-over on. npr_host: What motivated Copland's style of music? npr_guest: Well, he started out as a difficult, complex modernist -- but in the '30s, he came to feel that it ought to be possible for American composers to speak to a wider audience. So he deliberately simplified his style in pieces like "El Salon Mexico," which is based on Mexican dance-hall tunes. Then he got the opportunity to write ballet scores, which is how he came to compose "Billy the Kid" and "Rodeo." Those scores made him famous -- really, the first American classical composer to write for a large audience. He's still, with George Gershwin, the best-known American classical composer, and not just in America. His music is known and loved around the world. npr_host: Is it true that Copland composed a lot of music for the movies? npr_guest: IT sure is. In fact, Copland was the first important American classical composer to go to work for Hollywood. A lot of his fellow composers thought he was "selling out" by working for Hollywood studios. But nothing could be further from the truth. Copland brought his own distinctive style to Hollywood at a time when most movie music was very strongly influenced by European romantics -- in fact, most of it was written by European-born composers! Copland scored several well-known Hollywood films, including the film versions of John Steinbeck's "Of Mice and Men" and Thornton Wilder's play "Our Town." I think his very best film score, though, was for William Wyler's "The Heiress," a movie version of Henry James' "Washington Square" which starred Montgomery Clift and Olivia de Havilland. He won an Oscar for that score, which I think is just possibly the best film score ever composed by a classical composer. Of course he did it for the money -- he could live for a year or two on the fee for a Hollywood score -- but he never compromised his style, or his genius, and so his film music is an important part of his output. He turned "Our Town" into a concert suite that gets played fairly frequently, and Leonard Slatkin has recorded a short suite from "The Heiress." npr_host: Now, isn't it true that Copland wrote a lot of music during the '50s and was considered by McCarthy to be a Communist? npr_guest: You're touching on one of the most sensitive areas in Copland's life story. He was, in fact, *very* closely associated with the American Communist Party in the '30s. He always claimed he wasn't a card-carrying party member, but that was really a distinction without a difference -- he wrote for Communist-controlled publications, and even campaigned for Communist political candidates giving stump speeches! This aspect of his past caught up with him in the '50s, when Senator McCarthy's committee investigated him. He testified before that committee and was questioned directly by McCarthy. But fortunately, nothing came of it, and although his name was included in "Red Channels," the publication that listed Communists and fellow travelers in the media, Copland was able to continue his composing career with virtually no interference. In fact, during the time when he was under the closest scrutiny for his political activities, he came to be recognized, both in America and abroad, as America's most distinguished and characteristic composers. npr_host: So would you say Copland was a rebel in his music as well? npr_guest: That's an interesting question. Certainly Copland started out as something of a rebel. Of course, when he began composing, simply being an American composer who tried to write a distinctively American brand of classical music was to be a rebel of a sort. In the 19th and early 20th centuries, he wrote very derivative music based directly on European models. Charles Ives was writing radically innovative music, but nobody performed it and nobody knew about it. So Copland was doing something radically innovative when he sought to write classical music that was influenced by jazz, say, or American theater music. A lot of his music from the '20s and early '30s was quite dissonant and difficult -- like the "Piano Variations," which even now can startle audiences by how *tough* they are. In a way, it was rebellious when he turned his back on this kind of extreme dissonance and started writing popular, accessible scores like his great ballet scores. Bear in mind that these pieces, though popular, are also serious -- they are great light music. And a "popular," "accessible" piece like "Appalachian Spring" is great music, period -- in any way you want to define that term. npr_host: So how did he juxtapose those two sides of his musical personality? npr_guest: It was a gradual process. First, he wrote explicitly popular pieces like "Rodeo" side by side with more abstract, knottier pieces like the Piano Sonata. Then, he started to blend the two styles. The abstract instrumental pieces became warmer, more openly melodic. Then, in "Appalachian Spring," he wrote a ballet score -- by definition, not "abstract" music -- but one in which he didn't incorporate explicitly popular material. No cowboy songs, no hoedowns. It's a more serious piece. Yet every bar of "Appalachian Spring" is clear, clean, tonal, intelligible -- great music that anyone can grasp at first hearing. This was a great breakthrough in his style. Afterwards came the Third Symphony, his other clinching masterpiece, in which he infused the symphony, the great abstract instrumental form, with all the intensely personal and lyrical qualities of his more popular music. It's quite a balancing act -- but he pulled it off. npr_host: Is there one identifiable musical trait that is essentially Copland's own? npr_guest: I don't think just one. Let me approach that question in another way. Before Copland came along, we didn't have an "American" style of classical music -- a kind of music that you heard and knew, immediately, that an American had written it. Copland created that style out of his own imagination. It's an amalgam of the jumpy, angular rhythms of jazz; a "wide-open" style of harmony; a bright, uncluttered instrumental palette; and a remarkable gift for melody. Put all that together and you get the American sound in classical music. That's what you hear in "Appalachian Spring." Anybody, anywhere, would hear that piece and say: That's *American* music. npr_host: How did he create that open style of harmony? npr_guest: Two things characterize Copland's harmony. One is the use of lots of open fourths and fifths -- the intervals that contain no thirds, which define a harmony as major and minor. Another characteristic of Copland's harmony is the use of "telescoped" chords, like the opening of "Appalachian Spring," in which he stacks E major on top of an A major to create a clean, resonant sound that rings in the air. That's his "open-prairie" style, I call it that because the first section of "Billy the Kid," one of his earliest "popular" scores, is called -- logically enough -- The Open Prairie." npr_host: Some say he was Leonard Bernstein's greatest influence as a composer. Do you think that's true? npr_guest: Absolutely. To me, Leonard Bernstein's music -- which I love very much, by the way -- is a combination of Copland, Gershwin and Stravinsky. If you listen to Bernstein's "On the Waterfront" film music, you'll notice that the great last scene, the walk on the docks, is actually just "The Open Prairie," from "Billy the Kid," turned upside down and recast in 4/4 time. npr_host: What about their personal relationship? What did Copland mean to Bernstein as a friend? npr_guest: Copland was instrumental in introducing the very young Bernstein -- when he was just out of Harvard -- to the New York musical scene. It's possible that the two men were lovers at one point, though their correspondence has not yet been published and no one really knows for sure how close the association was. But certainly they were remarkably close their whole lives long, though the relationship was not without its straints. Copland had his doubts about Bernstein as a composer, and Bernstein had *his* doubts about Copland as a conductor! But they helped each other in all sorts of ways. Bernstein became known as the Great American Conductor in part because of his amazingly compelling performances of Copland's music. npr_host: The most interesting thing about Copland is that he created a musical picture of the West. But he actually never went west of the Hudson River as a kid. How did he do it? npr_guest: Well, his mother actually spent time in Texas as a child! But I don't think that did the trick. In a way, Copland's "Western" music is as much "Jewish" music as anything else. Virgil Thomson liked to talk about how Copland's favorite mood as a composer was the prophet, laying down the law -- those proclamatory solo melodies, often stated by a solo trumpet, that are so characteristic of his music. I think of Copland's "prairie" sound as being just as reflective of the loneliness of urban life. Another of the pieces played today by Orpheus is "Quiet City," a haunting musical portrait of New York late at night which, if you didn't know the title, might just as well be the sound of a lonesome cowboy off somewhere on the Great Plains. Music is ambiguous like that -- what you mean to portray isn't always what people hear! canada216 asks: Are you talking about "Fanfare for the Common Man?" npr_guest: Would you like to talk about "Fanfare for the Common Man?" We heard the U.S. Marine Band play that great piece this afternoon. It was written during World War II as part of a special commission from the Cincinnati Symphony orchestra -- about a dozen American composers were asked to write orchestral fanfares. Copland thought it would be a nice idea to do a "Fanfare for the Common Man," the regular GI type, since, as he said, they were the ones doing all the work in World War II. So he wrote that short, striking piece for brass ensemble and percussion, which is now one of his best-known pieces, though it didn't really become popular until after he reused its theme as part of the finale of his "Third Symphony" in 1946. Today, it's almost as well-known as "Hoedown." If I remember correctly, Emerson, Lake and Palmer did a rock version, and I used to hear Woody Herman's jazz band play what Woody called a "boogaloo" version! Copland claimed to like all these arrangements -- though perhaps because of the royalties they brought him -- but he always added that in the end, he liked his original version best. npr_host: Copland also studied literature in Paris and wrote songs based on poems. Would you say he was a literary musician? npr_guest: He had great literary sensitivity. He read constantly. One of his favorite writers was Andre Gide. He preferred essays to fiction and though he didn't write much vocal music, one of his greatest masterpieces -- perhaps, after "Appalachian Spring," *the* defining Copland work -- is his song cycle based on poems of Emily Dickinson. He could have made a living as a music critic -- he wrote insightfully, among many other things, about jazz (and particularly about Duke Ellington) as well as the very popular music-appreciation text "What to Listen for in Music," and collections of his essays. He also produced a two-volume autobiography in collaboration with Vivian Perlis that isn't very personally revealing, but tells much of interest about his career. His writing was rather like his music -- plain, clear, straightforward, serious without being heavy. npr_host: So is it fair to say that Copland felt classical music was meant for everyone? npr_guest: Absolutely. He dedicated the whole second part of his career to proving just that. Not only by writing clear, accessible, "popular" pieces, but by writing *about* music in so clear and meaningful a way. He is one of the greatest examples we have of a populist who was also deeply serious in his art. npr_host: What sort of background and education did he have? npr_guest: He didn't go to college, oddly enough, and was always a bit sensitive about it. He studied music privately from his early years onward, and had private tutoring in composition as a teenager. (His father, by the way, ran a Brooklyn department store, and was sufficiently well-to-do to subsidize his son's training.) After high school, he went to Paris, where he studied composition with Nadia Boulanger, the great disciple of Stravinsky. After Copland, dozens of well-known American composers worked with Boulanger -- but Copland was first, and showed them the way. Once he finished his studied with Boulanger, he was on his own. npr_host: So would you say Stravinsky influenced Copland? npr_guest: Yes. Stravinsky served as *the* great influence on his music. They shared the same rhythmic vitality, the same bright, clear instrumental palette, the same passion for the stage and particularly for the dance. In a way, I think of Copland as Stravinsky's greatest American disciple -- certainly his most distinctive and individual one. Stravinsky, by the way, liked Copland's music -- he was especially fond of the "Clarinet Concerto" and the Dickinson songs. npr_host: It is said he knew Prokofiev too. Were they colleagues? npr_guest: Well, their paths must have crossed at one time or another, but Prokofiev was quite a prickly customer, and I can't imagine their having gotten on at all well. Copland also knew Hindemith, and had similarly difficult relations with him. npr_guest: They both taught at Tanglewood during World War II. Hindemith thought that his young American pupils needed to be trained from the ground up -- that their techniques weren't up to composing on their own. Copland felt very differently about teaching: he wanted his students to compose, not to do exercises, and he wanted them to be able to *hear* their student works even if they weren't really finished composers. It was, in a way, a classic contrast between the European and American styles of education, and it made for some very uncomfortable exchanges, both in person and in their correspondence. Hindemith didn't really admire anybody who didn't write like him, though! npr_host: How do you think America most feels the loss of Copland? npr_guest: That's a very interesting question. I know I have felt throughout much of my adult life the absence of a composer who really wants to speak to a mass audience without compromising his essential seriousness. After Copland, we tended to have either avant-garde types or, more recently, minimalists whose music is *too* accessible. When Copland stopped producing new music around 1970 or so, it was a loss to American music life comparable to the loss of Britten in Engalnd or Shostakovich in Russia. Fortunately, that tide is turning, and a great many of the really gifted young composers of the present day are quite open about admiring Copland and having been influenced by him. But we had a rocky time of it in the '80s. npr_guest: Oh, yes, I adore the Violin Sonata. It was written shortly before "Appalachian Spring," and is very much the same sort of piece -- the same fusion of abstract and popular elements. I don't know why it isn't done *much* more often. I guess because it isn't flashy, but I think concert violinists would find if they tried it that audiences would respond very powerfully to its great beauty. Copland also did a brilliant arrangement of his "Short Symphony" for clarinet, piano and string quartet. And of course "Appalachian Spring" was originally composed for a 13-instrument ensemble -- nine strings, three winds and piano. In the '50s, when Copland dabbled in serialism, he composed a number of works for chamber-sized forces. And his last full-scale composition of any significance is the lovely Duo for Flute and Piano. npr_host: Terry, some say Copland led a tumultuous life that tapered off considerably... Why did it that happen? npr_guest: A sad, sad story. In the '60s, he started to compose less. Some, Leonard Bernstein in particular, thought it was because his kind of accessible music had become less fashionable among younger composers, and that this development discouraged Copland. Copland himself disagreed. He said he felt he'd said all he had to say as a composer, and from the early '60s onward, he began to spend more and more time conducting. The tragedy is that he was suffering -- though it wasn't diagnosed for some time -- from Alzheimer's Disease. He did no serious composing after the mid-70s, and though he was able to continue conducting until about 1980 or so, the effects on his memory became tragically apparent. At the end of his life, he was still able to conduct "Appalachian Spring," but he wouldn't necessarily know where he was when he was doing it. Eventually, his public career came to a close, and he spent his last year in isolation, like so many Alzheimer's victims. I can't think of another example offhand of another great artist who was struck down by this terrible affliction. Ryland_1981 asks: Is today the 100th anniversary of Copland's birth? npr_guest: Yes. Copland was born on November 14, 1900. He died in 1990, just a matter of weeks before Leonard Bernstein. And NPR is currently in the middle of an extended series of broadcasts commemorating the Copland centenary. Tune in! npr_host: Terry, how would you say American composers today like Aaron Jay Kernis make use of Copland's influence (if at all)? npr_guest: Kernis is one of a number of younger composers who, if not *directly* influenced by Copland, have certainly wanted to follow in his footsteps as regards his willingness to communicate with larger audiences. One minimalist composer who has been directly influenced is Michael Torke -- his music has Copland's harmonic fingerprints all over it. npr_host: So where do you see American music going now? npr_guest: I hope in a direction of which Copland would have approved! Certainly the most stimulating composer -- excuse me, composers -- of the present moment are all returning to the language of tonality. I call them "new tonalists." And there's no question that composers like Paul Moravec and Lowell Liebermann have been strongly influenced, if not by Copland's specific stylistic quirks, then certainly by his passion to communicate -- to write music that makes sense not just to other composers but to the public at large. npr_host: Do you think Copland would have approved of crossover music? npr_guest: I don't know. That's a tough one. He certainly liked jazz, and knew a lot about it, but I know he had some doubts about Gershwin as a serious composer! npr_guest: It's been a pleasure. Aaron Copland was one of the most respected American classical composers of the twentieth century. By incorporating popular forms of American music such as jazz and folk into his compositions, he created pieces both exceptional and innovative. As a spokesman for the advancement of indigenous American music, Copland made great strides in liberating it from European influence. Today, ten years after his death, Copland’s life and work continue to inspire many of America’s young composers. Copland was born in Brooklyn, New York, on November 14, 1900. The child of Jewish immigrants from Lithuania, he first learned to play the piano from his older sister. At the age of sixteen he went to Manhattan to study with Rubin Goldmark, a respected private music instructor who taught Copland the fundamentals of counterpoint and composition. During these early years he immersed himself in contemporary classical music by attending performances at the New York Symphony and Brooklyn Academy of Music. He found, however, that like many other young musicians, he was attracted to the classical history and musicians of Europe. So, at the age of twenty, he left New York for the Summer School of Music for American Students at Fountainebleau, France. In France, Copland found a musical community unlike any he had known. It was at this time that he sold his first composition to Durand and Sons, the most respected music publisher in France. While in Europe Copeland met many of the important artists of the time, including the famous composer Serge Koussevitsky. Koussevitsky requested that Copland write a piece for the Boston Symphony Orchestra. The piece, “Symphony for Organ and Orchestra” (1925) was Copland’s entry into the life of professional American music. He followed this with “Music for the Theater” (1925) and “Piano Concerto” (1926), both of which relied heavily on the jazz idioms of the time. For Copland, jazz was the first genuinely American major musical movement. From jazz he hoped to draw the inspiration for a new type of symphonic music, one that could distinguish itself from the music of Europe. In the late 1920s Copland’s attention turned to popular music of other countries. He had moved away from his interest in jazz and began to concern himself with expanding the audience for American classical music. He believed that classical music could eventually be as popular as jazz in America or folk music in Mexico. He worked toward this goal with both his music and a firm commitment to organizing and producing. He was an active member of many organizations, including both the American Composers’ Alliance and the League of Composers. Along with his friend Roger Sessions, he began the Copland-Sessions concerts, dedicated to presenting the works of young composers. It was around this same time that his plans for an American music festival (similar to ones in Europe) materialized as the Yaddo Festival of American Music (1932). By the mid-’30s Copland had become not only one of the most popular composers in the country, but a leader of the community of American classical musicians. It was in 1935 with “El Salón México” that Copland began his most productive and popular years. The piece presented a new sound that had its roots in Mexican folk music. Copland believed that through this music, he could find his way to a more popular symphonic music. In his search for the widest audience, Copland began composing for the movies and ballet. Among his most popular compositions for film are those for “Of Mice and Men” (1939), “Our Town ” (1940), and “The Heiress” (1949), which won him an Academy Award for best score. He composed scores for a number of ballets, including two of the most popular of the time: “Agnes DeMille’s Rodeo” (1942) and Martha Graham‘s “Appalachian Spring” (1944), for which he won the Pulitzer Prize. Both ballets presented views of American country life that corresponded to the folk traditions Copland was interested in. Probably the most important and successful composition from this time was his patriotic “A Lincoln Portrait” (1942). The piece for voice and orchestra presents quotes from Lincoln’s writings narrated over Copland’s musical composition. Throughout the ’50s, Copland slowed his work as a composer, and began to try his hand at conducting. He began to tour with his own work as well as the works of other great American musicians. Conducting was a synthesis of the work he had done as a composer and as an organizer. Over the next twenty years he traveled throughout the world, conducting live performances and creating an important collection of recorded work. By the early ’70s, Copland had, with few exceptions, completely stopped writing original music. Most of his time was spent conducting and reworking older compositions. In 1983 Copland conducted his last symphony. His generous work as a teacher at Tanglewood, Harvard, and the New School for Social Research gained him a following of devoted musicians. As a scholar, he wrote more than sixty articles and essays on music, as well as five books. He traveled the world in an attempt to elevate the status of American music abroad, and to increase its popularity at home. Through these various commitments to music and to his country, Aaron Copland became one of the most important figures in twentieth-century American music. 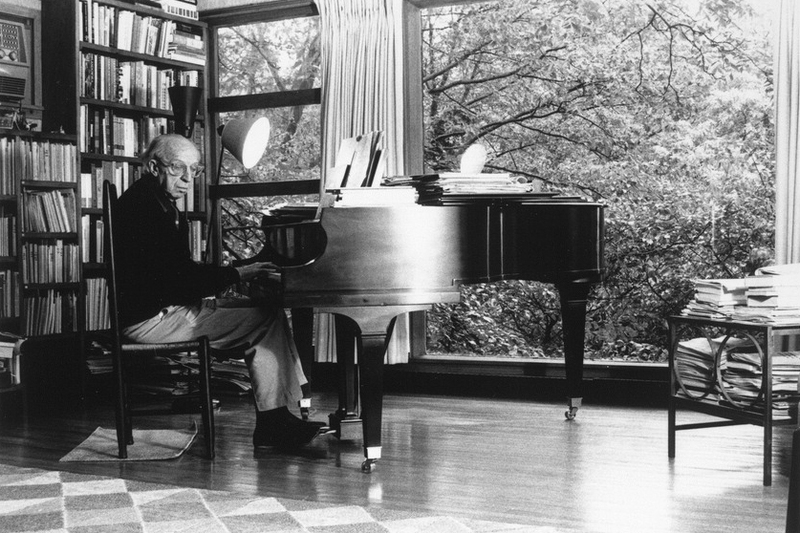 On December 2, 1990, Aaron Copland died in North Tarrytown, New York.